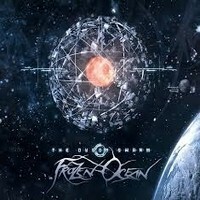 "The Dyson Swarm" is the eighth full-length studio album by FROZEN OCEAN, the brain-child of Russian musician Vaarwel. The one-man project is a blend of Atmospheric, Dark Ambient music, Electronic music and of course, Black Metal, making the FROZEN OCEAN sound arguably unique. The album is made up of seven tracks bearing not-so-easy-to-memorize astronomy-themed titles stating the concept of this record, something you might notice just by looking at the cover artwork. The material is mostly instrumental. The hypnotic loops of simple yet haunting melodies slowly but steadily build and conjure an eerily intriguing atmosphere made up of the uniquely-entwined electronic elements and Metal elements. At some point it kind of feels like a video game soundtrack, a great one. As we dive into the unfathomable depths of this dark opus, the Black Metal elements is gradually more prominent yet still not dominating, the dark-electro/dark-wave moments are. The whole thing feels very "modern." It's like Vaarwel was trying to create his own microcosm within huge musical atmosphere. However, it still feels quite minimal and simplistic, not really overloaded with useless over-the-top cacophonies thrown in there for the heck of it. Overall, there's nothing about "The Dyson Swarm" that I can complain about, it's solid and well-written. However, nothing about it really "grabbed" me either. I'd still recommend it if you'd like to delve into the bottomless abyss of FROZEN OCEAN's darkness.